There are more than 720 species of carnivorous plants spread over 17 genera in 5 orders. This includes plants that are fully aquatic to ones that live in deserts, plants that live in rain forests, fog forests, temperate forests, bogs, fens, swamps, grasslands, lakes, streams, and on and on. There is no one way to grow carnivorous plants in general and no one way to grow any given carnivorous plant. This Grow Carnivorous Plants section will help you grow and enjoy the more common and easier to grow carnivorous plants. General information on where to grow carnivorous plants. With a little ingenuity you can have a house and back yard full of carnivorous plants. Specific instructions on growing particular types of carnivorous plants. Try to concentrate on growing plants you can grow. How to make new plants. Propagating plants is fun. The basics of a plant's life. Plants need food too. Most carnivores need to be fed if there is no food for them to catch. Carnivorous plants have enemies and diseases just like every other plant. There are other nuggets of growing information scattered throughout the ICPS web site and its associated sites. ICPS FAQ (Frequently Asked Questions) -- Barry Rice's sometimes irreverent attempt to answer all your questions. Carnivorous Plant Newsletter index -- Find and read articles in old issues of CPN. ICPS Facebook forum -- Join almost 6000 members of the forum to ask questions and share your experiences. 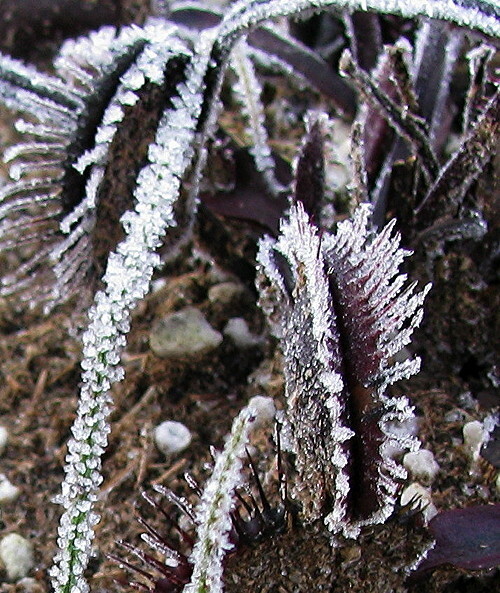 Hoar Frost on Venus Flytrap is no big deal. Photo by Djoni Crawford.